Apocalyptica gives hard rock the classical treatment, reworking Metallica classics for a symphony crowd. It's hard to overstate just how massive Metallica was in 1993, both in America and around the world. After methodically building an audience for its brand of thrash-metal — full of time changes and bone-crushing riffs — over the course of their first decade, Metallica's self-titled 1991 album (aka The Black Album) was a global sensation, selling more than 16 million copies in the United States alone and millions more overseas. The album kept Metallica on tour across the globe for years. In Finland, where Eicca Toppinen was studying classical cello at Helsinki's Sibelius Academy, Metallica was massive, going multi-platinum and inspiring the young musician to team up with some fellow cellists to try taking on some of Metallica's tunes with a classical approach. Toppinen's group was just in it for a little fun at first, blowing off steam outside the classroom. But their cello-fueled covers soon gathered the group a following, as well as a name that would do Metallica proud: Apocalyptica. "I just love the music," Toppinen says of Metallica's songs, in an interview from the road as Apocalyptica tours the U.S., including a stop in Spokane on Monday. "I get a lot of energy from the music itself." Toppinen wrote out the first Metallica arrangements for his cello quartet himself, a couple of songs from the same album "because I had money to only buy one sheet music book." But he and his friends didn't just do Metallica; within a couple months they were also creating arrangements of songs by Brazilian metal band Sepultura as well. It was, Toppinen recalls, "all about playing music we like with instruments we can play." 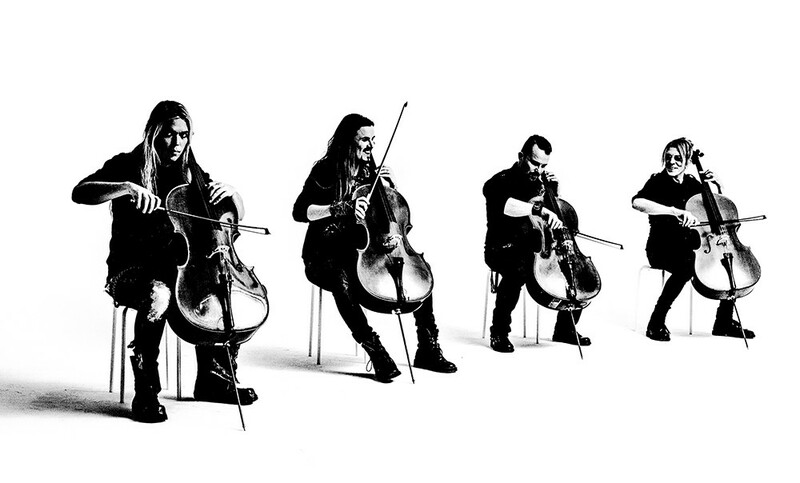 A record label eventually approached Apocalyptica about recording an album of rock-fueled cello and suggested they merely focus on Metallica. In 1996, Apocalyptica, released its debut album Plays Metallica by Four Cellos, a collection of eight dramatically reimagined Metallica classics like "Enter Sandman," "Master of Puppets" and "Creeping Death." The album sold a couple million copies and launched a successful career for Toppinen and his bandmates Paavo Lötjönen, Perttu Kivilaakso and Antero Manninen in both reworking rock 'n' roll tunes and writing original songs that deliver the same type of energy. They've released eight albums in all, plus an expanded, remastered version of the debut that they're celebrating with their Metallica-focused current tour. Figuring out how to reimagine and then perform the songs was not easy at first, Toppinen says, but the band's improved skill through the years allowed them to add a few new Metallica covers on the reissued Four Cellos album. "'Battery' was one of those songs, when we did the first album, we couldn't even dream about playing because it felt so difficult," Toppinen says of the battering-ram opening tune of Metallica's 1986 album Master of Puppets. "With the cello technique that we had, the classical technique, it just felt impossible to play. So [recording it for the reissue], that was kind of our revenge on the old times. We're like, 'Now we can do whatever we like! Let's record 'Battery!'" Toppinen's path to playing cello professionally wasn't exactly in the stars from the beginning. His parents were music lovers and could play a little bit, and his dad had a big collection of vinyl: "My father loved piano music and classical music. And of course they had some Beatles stuff." But for the young Toppinen, classical music didn't have much appeal until his older sisters started playing violin and piano. Not wanting to be left out, Toppinen started cello because "I just wanted to play something!" Despite starting on his instrument "pretty late, I was 9 years old," Toppinen's affinity for the cello took him to Sibelius Academy, where he was taught the classical techniques that would eventually allow him to explore the instrument in ways his classical peers never imagined. Namely, to rock out to some Metallica. "It's great music, and the songs are great, really great compositions," Toppinen says. "Of course, as cello players, we can use other skills that we don't use in the classical playing. Many things are very challenging to play by cello. It's a similar instrument to guitar, even the range is kind of the same, but the techniques and where the strings are and stuff, it's a lot harder to play cello. Very challenging." Apocalyptica's ability to rise to that challenge has made them global sensations themselves, and led them to perform alongside Metallica on more than one occasion. Early on in 1996, "maybe Apocalyptica show number five," they opened two shows for Metallica in Helsinki. "It was kind of ridiculous," Toppinen says now, but it was the start of a friendship that has lasted for years, and includes Toppinen playing at Lars Ulrich's wedding, and Apocalyptica performing at Metallica's 30th anniversary concert alongside Ozzy Osbourne, Megadeth's Dave Mustaine, Judas Priest's Rob Halford and other metal royalty. The original print version of this article was headlined "Classic(al) Rock"